This article is part of a zero-to-hero project — a multi-image gallery blog — for performance benchmarking and optimizations. (View the repo here.) In this part, we’ll set our project up so we can fine tune it throughout the next few posts, and bring it to a speedy perfection. Now and then you have to create a new project repository, run that git init command locally and kick off a new awesome project. I have to admit I like the feeling of starting something new; it’s like going on an adventure! We can think about the project setup as the very first step of our thousand miles (users!) journey. We aren’t sure where exactly we are going to end up, but it will be fun! Before starting any project, you should have a clear vision of the final destination. Where are you headed? Who will be using your app and how? What are the main features you’re building? Once you have that knowledge, you can prepare your environment, third-party libraries, and dive into developing the next big thing. 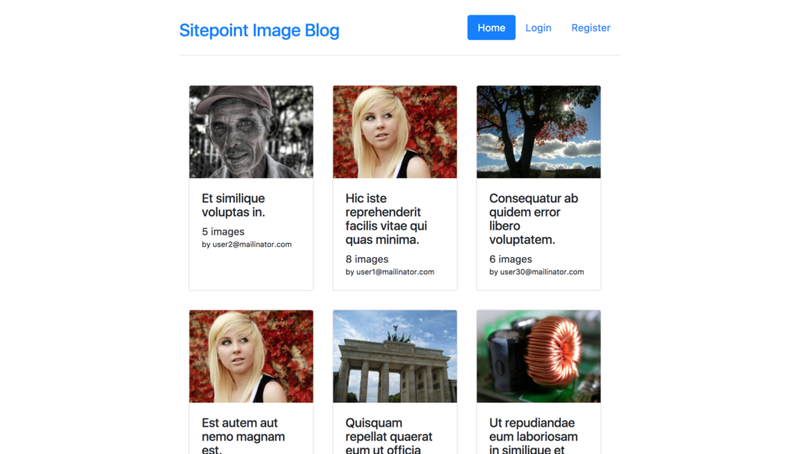 In this series of articles, we’ll be building a simple image gallery blog where users can register or log in, upload images, and create simple public image galleries with descriptions written in Markdown format. We’ll be using the new Symfony Flex and Homestead (make sure you’ve read tutorials on them, as we’re not going to cover them here). We picked Flex because Symfony 4 is just about to come out (if it hasn’t already, by the time you’re reading this), because it’s infinitely lighter than the older version and lends itself perfectly to step-by-step optimization, and it’s also the natural step in the evolution of the most popular enterprise PHP framework out there. All the code referenced in this article is available at the GitHub repo. We’re going to use the Twig templating engine, Symfony forms, and Doctrine ORM with UUIDs as primary keys. Entities and routes will use annotations; we’ll have simple email/password based authentication, and we’ll prepare data fixtures to populate the database. Set up an empty database called “blog”. Clone the project repository from GitHub. If you now open the app in your browser, you should see an exception regarding missing database tables. That’s fine, since we haven’t created any tables so far. Update the .env file in your project root directory with valid database connection string (i.e., update credentials). Run the database init script ./bin/refreshDb.sh and wait until it generates some nice image galleries. Open the app in your browser and enjoy! You can log in to the app with credentials user1@mailinator.com and password 123456. See LoadUserData fixture class for more details regarding generated users. In this section, we’ll describe how to set up a new project from scratch. Feel free to take a look at the sample app codebase and see the details. Flex is doing some serious work for us behind the scenes, and most of the libraries (or bundles) are already registered and configured with good-enough defaults! Check the config directory. You can check all the dependencies used in this project in the composer.json file. If this step executed fine in the “Getting Started with the app” section above, you should be able to see newly created tables in the database (for Gallery, Image and User entities). I can’t imagine developing an app today without having data fixtures (i.e., scripts for seeding the DB). With a few simple scripts, you can populate your database with realistic content, which is useful when it comes to rapid app development and testing, but it’s also a requirement for a healthy CI pipeline. I find the Doctrine Fixtures Bundle to be an excellent tool for handling data fixtures as it supports ordered fixtures (i.e., you can control the order of execution), sharing objects (via references) between scripts, and accessing the service container. I’m also using Faker to get random but realistic data (names, sentences, texts, images, addresses, …). Take a look at the script for seeding galleries with random images to get a feeling of how cool this combination is. Make sure you restrict execution of this script on production, or you’re going to have some serious fun at one point. One can argue that randomly generated data can’t reproduce different edge cases, so your CI can sometimes fail or pass depending on the data generation. It’s true, and you should make sure all edge cases are covered with your fixtures. Every time you find an edge case causing a bug, make sure you add it to data fixtures. This will help you build a more robust system and prevent similar errors in the future. Controller classes are located under the src\Controller directory and are not extending the existing Controller class provided by FrameworkBundle. All dependencies are injected through constructors, making the code less coupled and easier to test. I don’t like “magic” for simple stuff! In the new Symfony directory structure, templates are located under templates. I’ve created a master template base.html.twig that defines basic HTML structure and references external resources. Local assets are referenced by using the asset Twig function, as it will provide us with better control later (such as changing hosts and appending query strings for versioning). Other templates are organized in subdirectories within the src/templates directory. Services are automatically registered and configured by default in Symfony’s service configuration. That way, you don’t need to manually configure Twig extensions with filters for Markdown support and generating URLs for Image entities located under src/Twig. Hopefully, you already know about Git basics and understand how .gitignore works. We’re going to store uploaded files in var/uploads, so we need to create it first. Instead of doing it manually on every project setup, we can add a command for creating all the needed directories to post-install-cmd event in our composer.json scripts section and make Composer run that for us (for example, "mkdir -p var/uploads"). Read more about composer scripts here and auto-scripts here. We should add all other directories and files we want to be ignored to .gitignore but outside the commented and clearly marked section managed by Flex. Check your Homestead.yaml file for environment variables. If you already have an APP_ENV variable, Symfony won’t try to load the one from the .env file. Your best bet is to comment out the APP_ENV section in Homestead.yaml just to be safe. Cache clear within your Vagrant machine can fail because of permissions. You can simply run sudo rm -rf var/cache/* to clear the cache manually, or if that fails, clear it from outside the VM, on the host machine in the shared folder. In this article, we successfully set up a project with entities, controllers, templates and helper scripts. The database is populated with dummy content, and users are able to register and create their galleries. In the next article, we’ll demonstrate how to populate the database with a more massive dataset to test the app’s performance in a more realistic environment, how to set up a simple testing suite, and simple CI based on Docker. Zoran AntoloviÄ‡ is an engineer and problem solver from Croatia. CTO, Startup Owner, writer, motivational speaker and usually the good guy. He adores productivity, hates distractions and sometimes overengineers things.